Vitamin A Is The Key | iiaa Ltd | The UK and Ireland distributor of Environ Skincare, jane iredale makeup and Advanced Nutrition Programme. Many of us put aside concerns of sun damage in return for the transient glow of tanned skin. as we move into Autumn, clients will need to start thinking about repairing the damaging effects of higher levels of sun exposure. Read on to dispel myths surrounding the usage of vitamin A in a healthy skincare regime. 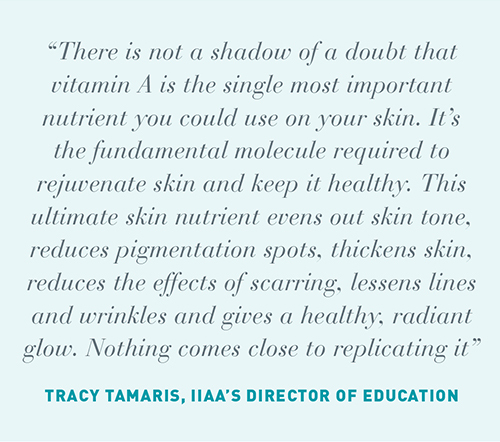 Studies show that vitamin A compacts the stratum corneum and thickens the epidermis, which runs completely contrary to the idea that it has a thinning effect. It influences the genes that cause epidermal stem cells to grow into fully functioning keratinocytes and mature into healthy layers of the epidermis. Vitamin A increases the growth of the basal layer which is why the epidermis becomes thicker and therefore more tolerant to damaging environmental effects. The retinol and retinoic acid forms of vitamin A do make the skin photosensitive, but the retinyl palmitate form has extremely valuable photo-protective properties. Research by the dermatology department at University Hospital Geneva showed that at high levels, topical retinyl palmitate was as efficient as an SPF20 sunscreen in preventing sunburn. However, UV light breaks it down, so also taking it as a supplement is recommended to support topical application. This is one of the most common myths and often arises from confusion about the Recommended Daily Amounts (RDA) for oral consumption. The RDA is the minimum amount needed to prevent diseases such as rickets and scurvy, NOT the maximum. According to the European Food Safety Authority, the upper tolerable level is 10,000 ius daily, and experts argue that it should be much higher. Dr Fernandes is a strong advocate of supplementing with vitamin A. “When we apply vitamin A to the skin, only a fraction of it penetrates down to the level of the dermis and even the most sophisticated modern tests have barely been able to detect any vitamin A in the bloodstream even when very high doses are applied”, he says. “I feel nervous if I don’t apply it every day via my Environ® creams, and feel more assured if I take 40,000 – 50,000 ius of vitamin A daily”, he adds. “It works with our DNA to determine how skin cells behave, how they differentiate into specialist cells and how they mature, not just in our skin but throughout our whole body… It is fundamentally the most important molecule in addressing sun damage and anti-ageing. There is nothing else like it”. Although there are several forms of vitamin A, they are all ultimately converted into retinoic acid which is the one that does all the work. These are known as retinyl esters and are the milder, more stable fat soluble forms of vitamin A which are active but still easily tolerated by skin. This is the form of vitamin A stored in our liver, our skin and cells all over our body. This is the alcohol form and is used to transport vitamin A in the bloodstream. It’s highly active so although it does achieve excellent results it can also be quite irritating on skin, sometimes causing it to peel. You should only recommend the use of this as part of a client’s Environ® skincare programme once their skin has become accustomed to high levels of retinyl palmitate and acetate within the step –up system. This is the form of vitamin A which is essential for night vision. It is sometimes used in skincare because it is only one metabolic step away from retinoic acid and can make the same changes to the skin, but is less irritating. However, once it’s applied virtually all of it is converted into retinyl esters and only a tiny fraction becomes retinoic acid. What form of vitamin A is in Environ’s Youth EssentiA® and Skin EssentiA® ranges? These Environ® ranges use the milder forms of vitamin A to avoid retinoid reactions and to enable skin to become accustomed to increasingly high levels. • Environ® Skin EssentiA® Vita-Antioxidant AVST Moisturiser 5 contains both. • The Youth EssentiA® range features retinyl proprionate in levels 1-4, but Vita-Peptide C-Quence Serum 4 also includes retinyl palmitate.